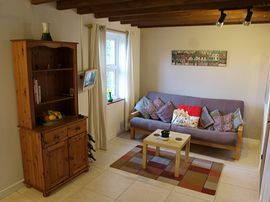 Recently refurbished, Bluestone cottage has been designed as an eco friendly holiday retreat for two people, offering comfortable and stylish accommodation. 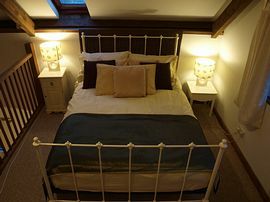 The cottage has a galleried bedroom, kitchen, living area and bathroom. We are keen to make your holiday as ecologically sustainable as possible, so there is solar heated water, wood burning stove and private water and drainage. If you are looking for a quiet and peaceful holiday retreat away from the pressures of modern life - this is it! 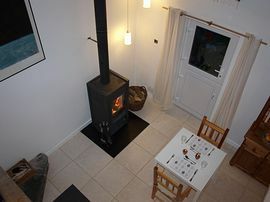 The cottage is located on a minor rural road, well away from the village. It has its own private garden, a wonderful rural outlook and is not overlooked. Hebron is ideally located for those wishing to explore the wonders of West Wales, being close to the coasts of both North and South Pembrokeshire, where you can enjoy some of the best coastal walking in the world, or relax on lovely beaches that are rarely crowded, even in high season. Or you can just spend a week relaxing in the South facing garden. Excellent location for touring, walking and beaches. Local Services: Pub in walking distance, shop aproxemently 2 miles away. 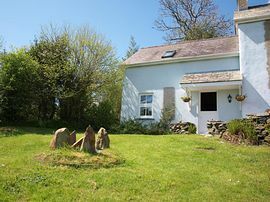 Bluestone Cottage is located near the village of Hebron, just over a mile from the A478 Narberth to Cardigan Road. Cardigan is about 12 miles and 20 minutes by car, and Narberth is about 10 miles and 15 minutes by car. 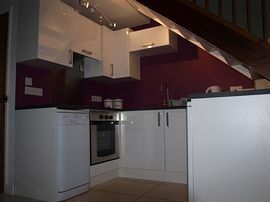 Exact directions will be supplied with confirmation of your booking. Low season short break from: £125. One week from: £175. High season short break from: £210. One week from: £295.